Exciting New Products and Happenings at Dolls4Tibet! 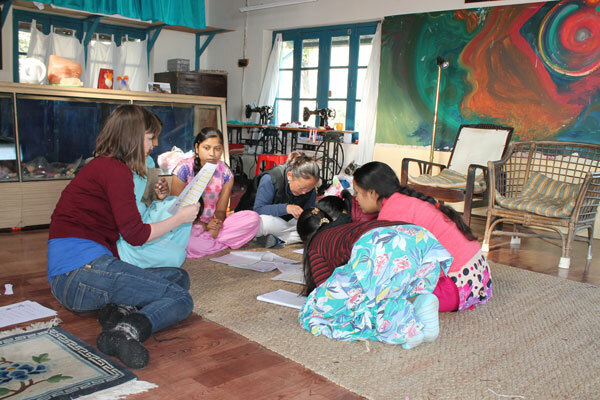 The word ‘change’ is what springs to mind when we think about the last few months at Dolls4Tibet – a big move, a change in staff and some exciting new partnerships have all contributed to making it a very busy and interesting time. Our workshop has moved to larger and more visible premises closer to the main road just above Dharamsala. The new workshop allows the staff a much healthier, more comfortable and more dedicated workspace in which all our doll makers, tailors and other staff can work side by side. It was also time to separate the workshop from the family home, where it had been from the beginning. The rooms are spacious and bright, and there is plenty storage for all our materials, threads and finished dolls. By moving we also hope to attract more staff as well as artists and visitors to the workshop. 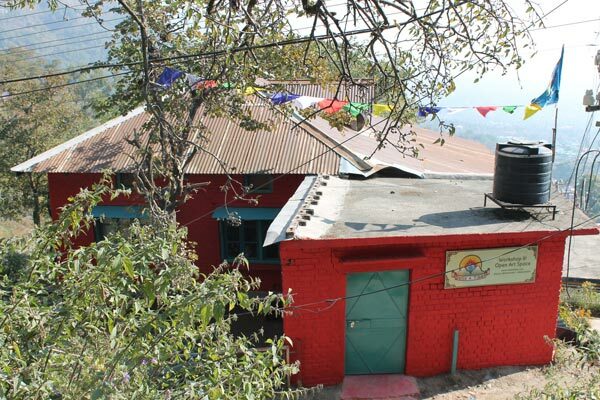 As we do not have our own retail presence in McLeod Ganj, we want the workshop to be more easily accessible and above all an inviting place to come and see the dolls being made and to purchase them. Additionally, because the premises were previously used as an artists’ studio, our wish is that it continues to be used as such. Within the new space we have a large, airy, open plan area which is not used for doll production. The idea is that this space be open and welcoming to other artists for music, film, gatherings or any artistic purpose. Unfortunately, during the moving process we have said goodbye to some of our Tibetan members of staff, mainly for personal reasons. We are missing them a lot as friends but also for their expertise in the midst of the Christmas rush! We are eagerly trying to keep up with Christmas orders that come in thick and fast, and really appreciate all your continued support during this time of change. Due to the loss of staff we have had to cancel lots of Christmas orders which we are very sad about. We thank you for your understanding and your continued interest in us. As you may have noticed, we have recently added some new products in our shop. First and foremost, we’ve introduced a wonderful range of Indian friendship dolls inspired by regional dress from Himachal Pradesh, Ladakh and Balti. This has been our plan for a long time because a significant portion of our employees are Indian ladies, and we are of course based in Himachal Pradesh. New to our Tibetan friendship doll collection are our (already popular) Chupa-wearing traditional Tibetan boy Karma and Dolkar who wears a high-buttoning flowery Tibetan dress. To our Himalayan Angel collection we’ve introduced our Standing Angels and our gift pack of 5 super-cute mini angels (perfect for the Christmas tree!) – two more bright ways to decorate your home. We’ve brought in a cosy (and already well-appreciated!) poncho and hat combo to our dolls’ knitted accessories range. 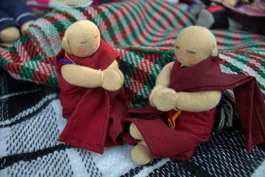 And last but not least our mini monk dolls, complete with robes and clasping hands. The mini monk dolls are currently not available via the website as our initial motivation was to create a product to appeal to the local market! Following our collaboration with the Avalokiteshvara Trust, our new partnership is to be with Oxfam Australia. We have newly entered into an agreement with Oxfam for them to distribute our dolls in Australia. This is fantastic news for Dolls4Tibet because as you know Oxfam is a huge organisation that can reach out to many people. Through this partnership we hope to spread the word about Dolls4Tibet even further as well as provide a thoroughly stable source of work for our staff. We are very much looking forward to working with Oxfam Australia. Finally, we are very glad to tell you that a large group of our dolls has recently made its way south in India to the Mainpat Tibetan community. This is courtesy of Karma Dondub / Dennis Barbion who is the Associate Director at Tibetan Social Services, Co-ordinator of Tibetan Social Services in Belgium and President of Tibetaanse-Vlaamse Vriendenring. 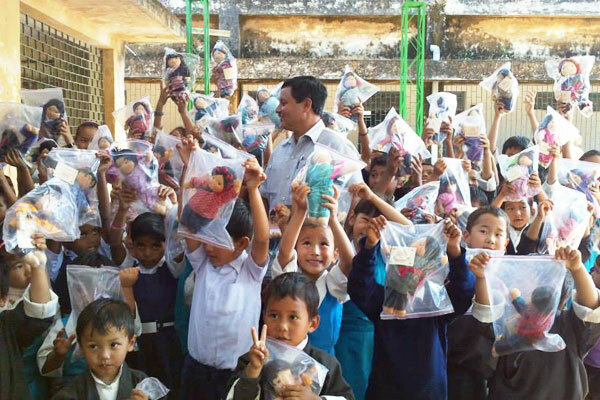 He has spent the last months fundraising hard to get the money together to make sure every child in the Primary and Pre-primary schools in Mainpat would receive a doll, and so they did! 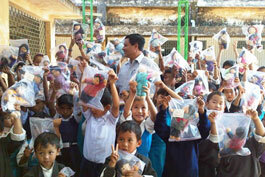 As you may know from our website, the benefits of our Donate a doll project are three-fold. It raises awareness of Tibet as well as our project, it provides invaluable work for our doll makers and tailors ,and it gives the children a healthy, culturally relevant companion with which they can identify and take pride in. Our heartfelt thanks go to Dennis and anyone else who helped reach this extremely worthwhile goal. You only have to look at the smiles on the children’s faces to know how worthwhile this venture was.